Working for a small team within the marketing department of CST, I was forced to become a jack of all trades. Often challenging, one could also see the opportunity as quite thrilling. My digital skills were honed while I learned about the world of print from a legendary Chicago publication. Chicago.com, a tourism travel domain owned and operated by The Chicago Sun-Times, was due for a refresh, and with that, my work was cut out for me. Chicago.com's dining site, Chicago Eats, was launched during my time at CST. It was a total pleasure to create a site that catered to the needs of the hungry Midwest. The CST Marketing team created several ads that appeared on buses, trains, and digital spaces for the duration of Spring in 2015. A no-holds-barred approach was taken in order to drive newspaper sales and remind the city of classic watchdog journalism that was such a vital part of the Chicago experience. 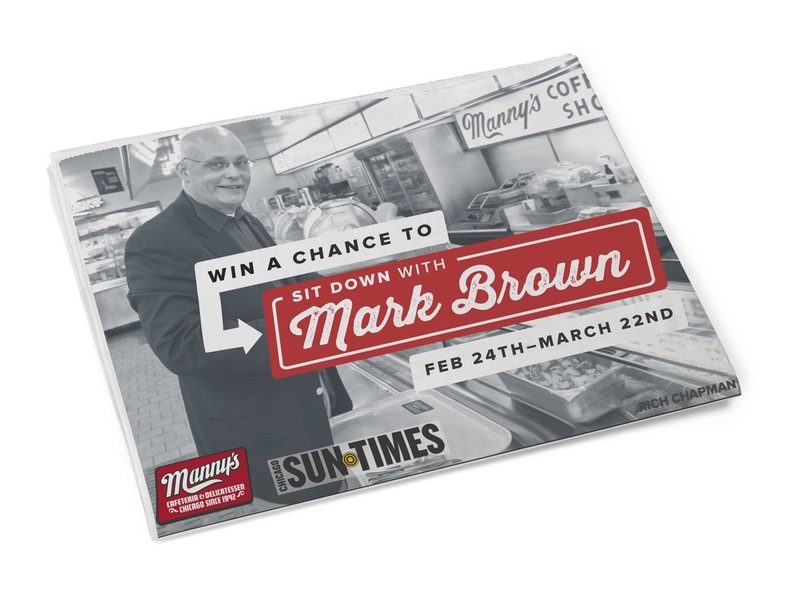 I was creative lead on the "Sit Down with Mark Brown" campaign that took place in Winter 2015. Over the course of 12 weeks, readers answered trivia based on a legendary columnist's clips in order to win a buffet dinner at the legendary Manny's Diner with the Chicago writer. Chicago Sun-Times' dramatic brand transformation happened not only on the front page, but also on apparel, retail slots, and on Chicago's streets. I was proud to have designed the materials that made their way to the metropolitan area and continue to represent the publication in urban spaces.